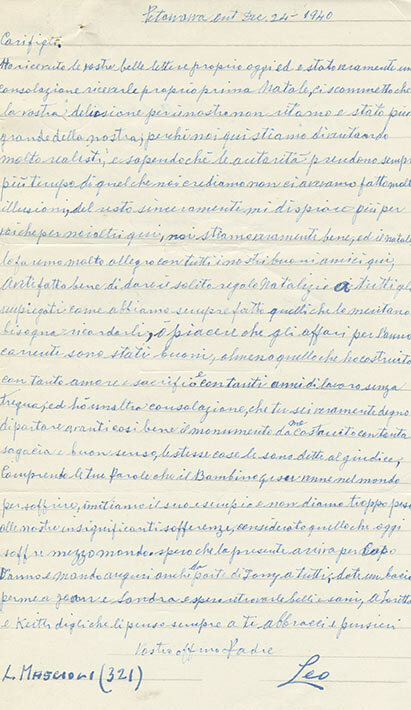 This is a handwritten, one page letter from Leopoldo (Leo) Mascioli to his son, Daniel Mascioli. Written on lined paper with blue ink in Italian. I’ve received your beautiful letters today and it was truly a consolation to receive them before Christmas. I would bet that your disappointment of us not returning was greater than ours because we’re becoming more realistic here knowing that the authority always takes more time than we believed. We experienced a lot of disappointment in the past. For the rest, I’m more disappointed for you than us here. We are truly good and Christmas we are passing it fairly happily with all our good friends here. You have done well to have given the usual Christmas gifts to the employees as have done in the past. Those that deserve it, we must remember them. I am pleased that the affairs for the current year were good. At least what I built with so much love and sacrifice and many years of work, without a doubt I have another consolation that you are truly worthy to move forward so well, the monument built by me with so much know how and good sense. (The same things that were told to the judge). I understand your words that baby Jesus came into this world to suffer. Imitate his example and let’s not give too much weight to our insignificant suffering considering that half the world is suffering today. I hope that this arrives for New Year’s. I send regards from Tony as well to all. Give a kiss from me to Joan and Sandra and I hope to find them beautiful and in good health. To Loretta and Keith, tell them that I always think of them. To you, a hug and thoughts.